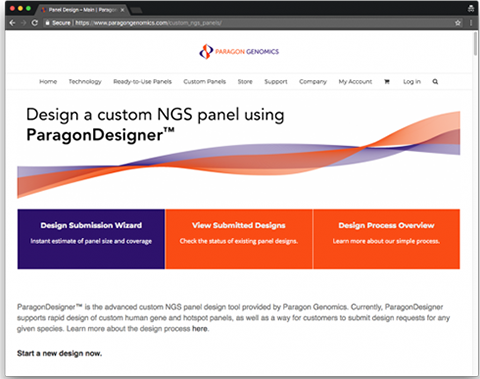 Paragon Genomics has launched ParagonDesigner, a web-based tool that enables rapid design of CleanPlex Custom NGS Panels. The online portal features a streamlined, user-friendly interface that simplifies the assay design process, allowing researchers to build customized next-generation sequencing (NGS) assays for their specific needs. With ParagonDesigner, users define the content of their custom NGS assays by submitting their targets online. The tool features a database of more than 1,300 pre-designed, clinically relevant human genes, allowing CleanPlex Custom NGS Panels to be assembled for most applications. The design tool also issues a report on the estimated panel size and design coverage for review prior to submission. Panel design experts are available to provide support to all customers. The company delivers custom NGS panels in 2 to 4 weeks.